Kula Botanical Garden began their annual Christmas tree sale yesterday and it continues today, and Friday, Saturday and Sunday, Dec. 5,6,7. The trees are freshly cut and range in height from 3 feet for $36 to 20 feet for $950. The garden is located at 638 Kekaulike Avenue and is open from 9 AM to 4 PM every day of the year. 808-878-1715 This is a nine-acre farm owned by Helen and Warren McCord and they sell between 1,000-2,000 Monterey pine trees per year. Kula 808-878-1468. Owned by Shirley and Hugo Buetler, this a coffee, protea and fruit farm with three acres of Christmas trees. Yes, that’s a real tree behind us! 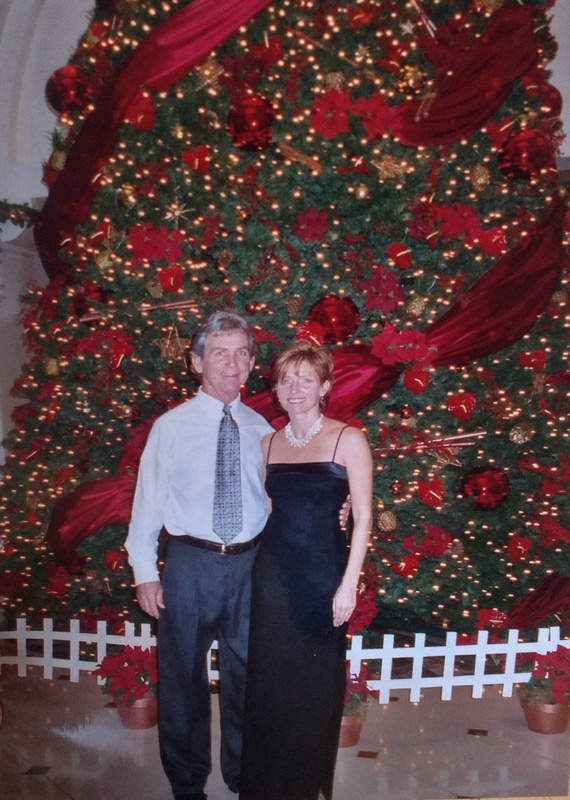 This was taken at the Fairmont Kea Lani when we attended the Aloha Ballroom Dance Academy Christmas ball (www.alohaballroom.com). Only time I’m ever able to get Mike in a tie. And new this year: ICE skating on Maui! Start a new holiday tradition with ice skating in the tropics. Their ad says “The winter wonderland escape at the Westin Ka’anapli Ocean Resort Villas features a hybrid ice skating rink complete with holiday music, lighting, and magnificent ocean views. It’s the perfect place to create lasting memories with friends and family. Now till January 3, 2015 4 PM to 9 PM, daily. $15 per person for 30 minutes, including skate rental. There are a number of things happening at the Maui Artsts and Cultural Center. There are the first light screenings of the new crop of Christmas movies on the wonderful large screen at the MACC. (www.mauiarts.org). Check put the website for concert info, too…Jason Mraz and Raining Jane! Hui No’eau, Maui – What will you create? If you come to Maui for the holidays, I hope you find lots to enjoy! A hui hou! Mahalo for reading along. If you’d like to stay in the loop, please click the “Follow” button on the Homepage or to the right. This entry was posted in Life in Hawaii and tagged Christmas displays on Maui, fresh Christmas trees on Maui, hui visual arts center, ice skating on Maui, maui arts and cultural center, Maui Christmas 2014, things to do on Maui for the holidays, Westin Ka'anapali Ocean Resort, where to find a Christmas tree on Maui by jamaicawtr. Bookmark the permalink. put in writing this website. I’m hoping to check out the same high-grade blog posts by you later on as well. am waiting for yоuг next posdt thank you once again.